Esen Tunar has been impressing people with his astrophotography and aurora pictures on Flickr for some time but he's not just a sky watcher as the images in this weeks featured photographer show.. I was born and grew up in Cyprus. Most of my childhood passions were influenced by my older brother, so I ended up doing what he did; fishing and snorkelling were the two main ones. I loved fishing when I was a kid, and used to spend hours sitting on a rock patiently hoping to catch just one fish. And when I wasn’t fishing, I would be in the water, searching for seashells. Me and my brother used to have a huge seashell collection and we occasionally used to fight about who gets to keep what in their room :). I left Cyprus when I was 17 to go to university in USA (again following my brother). Afterwards, I came to UK and have been here for the last 6 years. My photographic journey is a bit odd I think. I have always enjoyed taking pictures since I was a kid and remember having simple point & shoot cameras. But my pictures were nothing more than family and holiday snaps. I have also always been fascinated by the night sky and pictures of the Milky Way. We used to have a summer home by the coast, away from any light pollution and I spent many nights in the garden watching the stars. I wanted to take pictures of the Milky Way myself, but never managed it with a point & shoot. I have only been recently introduced to world of DSLR photography when one of my friends got a Canon 450D and showed me all the things you can do with a DSLR. I was immediately blown away. Shortly after that, I bought my own DSLR (Canon 450D) with the hopes of taking pictures of the night sky. One of the comments I often receive about my photography is how natural all my pictures look. I love capturing the beauty of outdoors and nature. I try to capture a scene as seen by the eye and then try to preserve that look during processing. After I got my first DSLR and failed to take good pictures of the night sky because of the weather conditions here, I was a bit lost. I was using my camera often, but my pictures were not much more than snaps. One day I went to the Burnham-On-Sea to take pictures of the lighthouse and I ran into Anthony Spencer. This was before he won the LPOTY competition. We started chatting and he gave me few tips and showed me an ND filter and what you can do with it (I didn’t have any filters back then – just a camera and tripod). But the “epiphanic” moment came afterwards when I went home and looked at his website. I was amazed by his work and I decided I wanted to take landscape pictures like he did. And since then his work has been my inspiration. Another turning point in my photography was last autumn. Around that time, I was very eager about selling prints and taking pictures that would please a large audience but I suddenly came to a realisation that I wasn’t really feeling satisfied with my pictures anymore. After that I decided that I am doing this as a hobby and not a job. I decided to go back to only taking pictures that are special to me. I love nature and capturing its beauty. I also love travelling but I don’t think I would go to extremes I go now if I weren’t doing photography. I enjoy the solitude and peace you get when you are out shooting in dawn or dusk when there aren’t many people around. As I mentioned before, my first passions as a kid were fishing and snorkelling. I still do snorkelling when I go to Cyprus for holidays but I haven’t been fishing in ages. I would love to pick it up again, but I spend too much of my time with photography. I studied Electrical Engineering in USA before I came here to do my masters degree in circuit design. I now work as an electrical project engineer at Hinkley Point Station in Somerset. My gear setup depends on the occasion. My full gear is a Canon 6D, 17-40mm f4, 24mm TS-E, 70-200mm f4, Sigma 50mm f1.4, and Samyang 14mm. For day trips, I usually have all my gear with me except the 14mm. I use the 14mm lens only for astrophotography. If I am going to a long hike or a wild camping trip, then I only take the 70-200mm and either 17-40mm or the 24mm TS-E.
My most used lens is the 24mm TS-E. This is my default lens for wide-angle compositions. I love the DOF control you get from the tilt function. I try to find my compositions with the 24mm field of view in mind and only swap to 17-40mm if a composition I find doesn’t work with the 24mm. You like to wild camp and have done so in some pretty extreme conditions. What advice would you give somebody who wants to wild camp in the hills for their photography?. This is not only for camping, but never underestimate the British hills. You can start the day sunny and end up in blizzard mere hours later. So always be prepared for worst. This is even more important for wild camping. You need to make sure you have the right gear to keep you dry and warm even in worst conditions. I remember hiking up Brecon Beacons for a sunrise shoot with few other photographers few years ago. Conditions at the car park were great; warm weather with good visibility, but when we made it to the top, we were engulfed in a blizzard with zero visibility and much colder temperatures. This just shows you how quickly things can change. What gear do you take out on a typical wild camp session, hot or cold? I am a cold sleeper, so I probably use warmer than necessary camping gear for some stuff. My main sleeping bag is RAB 4-season lightweight sleeping bag (Neutrino Endurance 400) rated down to -6 C.
For colder days I have a sleeping bag liner that provides a bit of extra warmth. I also have my down jacket with me for colder days, which I wear inside the sleeping bag if I really need extra warmth. I also have an extra warm sleeping bag rated down to -25 C but I have only used it in campsites so far as it is a bit big and heavy. But I am planning on using it for very cold trips like the last Easter. My summer sleeping mat is a Therm-a-Rest half-size inflatable lightweight mat. And for rest of the year, I use Exped Synmat fullsize Inflatable mat. I mainly use a 1-person mountain tent (Tarptent Scarp 1) as it is light and strong, but I also have a 2-person Terra Nova Superlite Quasar, which I use for shorter hikes, or when I know it’s going to be very windy. Other than these I also have a pair of walking poles, gas stove, pot for cooking, food (usually dehydrated meal), snacks and waterproof clothing. I also have ice crampons with me during winter. I use Adobe Bridge to manage my pictures and also for RAW conversion. Once I do the basic adjustments in Camera RAW, I bring the images to Photoshop. I use Photoshop to do local adjustments to the picture if necessary. I rarely do anything more than the usual curves & vibrancy / saturation adjustment. But I tend to leave images open in Photoshop for a long time and then I glance at them every once in a while to see if everything is as it should be. So this leads to a big “to be processed” folder on computer most of the time, especially after a big trip. I do print occasionally. I have few pictures displayed in my home and I usually replace them every few months. Because I don’t print often, I don’t have my own printer – (or maybe I don’t print often because I don’t have my own printer :) ). I use The Print Space for my prints and love the quality of their C Type prints. I would love to get a very large print made I can never decide on which picture to choose. I don’t know if it’s because I have been doing photography for only a short time, but I don’t really know many photographers from the film days (who are usually the inspiration for most today). I do like David Noton’s style, and his book “Waiting for the Light” is one of the first photography books I bought. I am also impressed by David Ward’s work, but then again, who isn’t? As I mentioned before, Anthony Spencer’s work has been a big inspiration for me. And if I had to pick only one photographer, it would probably be him. Another photographer I look up to from the digital generation is David Clapp. He has a very clean, sometimes a bit “funky” style. To be honest though, it is very easy to be inspired by many other hobbyist photographers that I follow on twitter. I see great images shared on twitter almost daily. I also find Alex Nail’s dedication motivational for my wild camping trips. This was taken in Snowdonia last easter when we had the cold spell. After a bit of deliberation, I decided to go for a 3-day wild camping trip on the Glyder Range. It was the most extreme conditions I camped in and I had to pitch my tent on frozen ground as everything was covered in ice. I even questioned my logic of coming up here on my first night as I tried to keep warm in my sleeping bag. I found this composition on my last night however the light was not good. So when I saw the clear skies next morning, I was thrilled. Soon after the sunrise, golden light hit the frozen ground creating this wonderful scene. All the suffering was worth it in the end. I know Glastonbury Tor is one of those locations done to death but on a misty morning, it is one of the best spots in the area. On this autumn morning I drove to the Roman Hill first to get above the mist to check the conditions. As soon as I saw the thin whispy clouds towards East, I knew it was going to be a good sunrise. So I rushed up the hill and set up my camera and waited anxiously. During the few minutes before the sunrise, the sky became alive. In addition, the twilight colours casted this pink hue to the mist down on the Levels. This is Somerset Levels at their best for me. I took this one during a trip to Scandinavia in 2012. I spent most of the trip in Sweden due to the weather conditions but managed to make my way down to Lofoten Islands (which was the purpose of my trip) for the last 2 days when the weather improved. And as a bonus, I was treated to this display of Northern Lights on the beach. It is amazing enough to catch a glimpse of just the Northern Lights, but being able to capture it over an amazing landscape like this was one the best experiences of my life. I love hiking and outdoors, so I’d probably be out somewhere hiking and camping. In fact it might actually be easier without all the photography gear. Or if the weather is bad, I’d probably be sitting in front of the TV playing PlayStation. Even though I love the outdoors, every once in a while I have these long PlayStation sessions. Arild Heitmann, a Norwegian photographer, has some great work from the wilderness of Norway. Thanks to Esen for a great combination of answers and images. 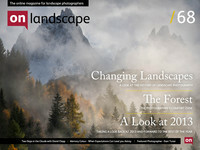 You can read Esen's 4x4 landscape photography portfolio. If you want to see more of Esen's work you can visit his website at esentunar.com or Flickr, or on social media @esentunar or Facebook.